Can You Eat Celery & Almonds If You Have Diverticulosis? Can You Eat Celery & Blueberries If You Have Diverticulosis? With the sustained emphasis on eating a healthy diet, fruits such as blueberries, blackberries, strawberries, raspberries and other seeded berries are readily recognized for their nutritional benefits. When eaten with their seeds and skins intact, blueberries are great source of dietary fiber. Fiber, a special form of complex carbohydrate, travels relatively intact through your digestive tract and promotes normal bowel movements. The Institute of Medicine advises women to eat a minimum of 30 grams of fiber a day until age 50 and then 21 grams daily after that. Men need at least 38 grams of fiber daily through age 50, when the requirement drops to 30 grams. Your child’s diet should incorporate at least 10 grams of fiber daily plus an additional gram for every year of age. A 3-year old needs a minimum of 13 grams, for example, but a 10 year old requires at least 20 grams for good health. If you eat a 1-cup serving of fresh blueberries, you’ll add 3.6 grams of fiber to your daily intake, along with 84 calories and 21.5 grams of carbohydrate. The same portion of frozen unsweetened blueberries delivers 4.2 grams of fiber and 18.9 grams of carbohydrates in 79 calories. Blueberry juice typically has 5 grams of fiber in a 1-cup serving, along with 19 grams of carbohydrates and 80 calories. Blueberries offer a fiber-rich, low-calorie snack or menu item relatively low in carbohydrates, particularly if you select fresh or frozen berries rather than fruit canned in sugar syrup. When you eat or drink a blueberry product, the fiber from the fruit makes you feel full sooner and stay full longer than low-fiber processed foods. This effect helps you achieve or maintain a healthy body weight. Fiber also slows the absorption of nutrients from your intestines, providing a steady blood glucose levels that’s beneficial to people with diabetes. If you’re on a high-fiber diet for your overall health, or if your doctor has advised you to increase your dietary fiber to control a chronic disease like constipation or diverticulosis, blueberries are a great menu option. Although fruit juices are usually much lower in fiber than their raw counterparts, blueberry juice is an exception to that rule. 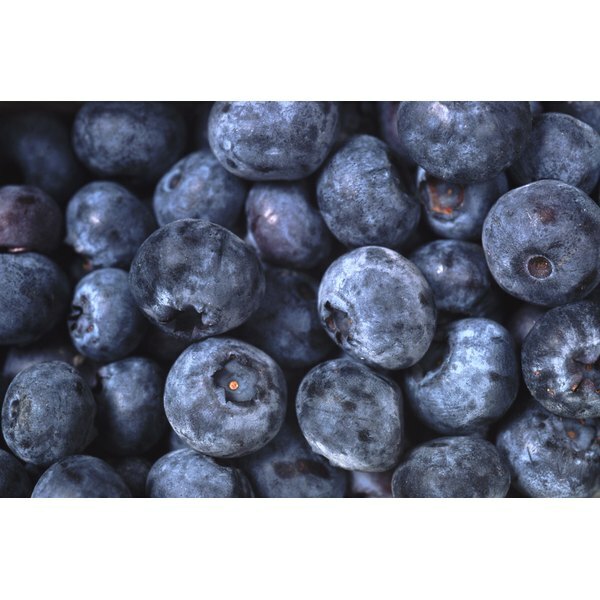 You can enjoy fresh, frozen or juiced blueberries as one part of your high-fiber diet. If your doctor recommends a low-fiber diet for certain disease phases or before medical procedures, stay away from blueberries in any form. What Are Health Benefits of Celery Sticks?